Every now and then, in the course of researching the Virginia Glee Club’s history, I find myself following up loose threads that take me to some unusual places. This week I paged through old issues of the Madison Hall Notes, the weekly journal of the University of Virginia YMCA. The journal was published from around 1905 through about the start of the first World War, at the height of the Y’s influence over the student body, and contain a wealth of information about student life—including the Glee Club. During this period, the Glee Club ebbed and flowed, but during three of its most active years (1905-06, 1910-11, and 1915-16) it was closely associated with the YMCA, and actually rehearsed in Madison Hall. As a result, its rehearsals and performances were listed in the Madison Hall Notes. 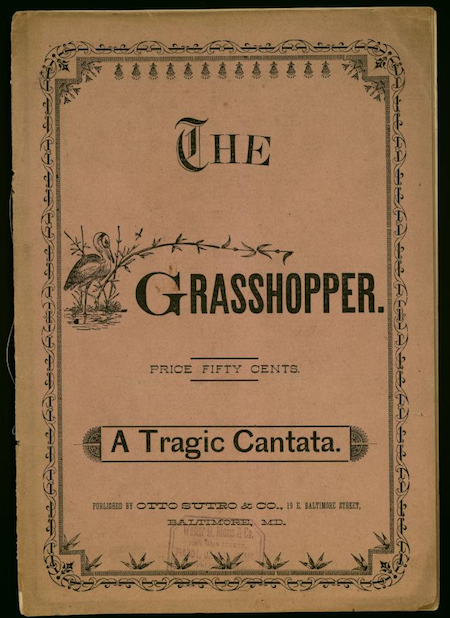 I learned about a few concerts in Lynchburg and at Sweet Briar and Hollins… and about the Grass-Hopper Cantata. Seems that in April 1911 the Glee Club did a joint benefit for the King’s Daughters (a hospital charity) and the UVA General Athletic Association, and performed the “Grass-Hopper Cantata.” What the heck is that? Apparently an 1878 takeoff on Italian opera by Innes Randolph, which was still being performed thirty years later… There’s a copy in the University of Virginia Library for those who feel inclined to dig deeper; I am just amazed to learn such a thing existed.